Feel your daily stresses melt away as you cross the historic Dismal Swamp Canal and walk along the 300-foot boardwalk into this geological wonder. Experience first hand the lush swamp forest and get up-close and personal with the wide variety of wildlife. Discover the uniqueness of a million year old habitat at the Dismal Swamp State Park. For the adventurer, there are 16.7 miles of hiking and mountain biking trails. Or, enjoy a leisurely paddle down the Dismal Swamp Canal in your canoe or kayak. Learn why George Washington called the Dismal Swamp “a glorious paradise”, how the swamp was important in the Underground Railroad and the ecological importance of wetlands in the visitor’s center and exhibit hall. All of this and more can be found just 3 miles south of the NC/VA border on US Hwy 17. 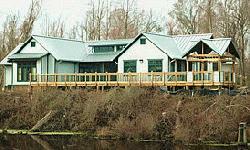 Visitor Center: A unique hydraulic arm bridge that spans the Dismal Swamp Canal allows access to the Dismal Swamp State Park. Boaters along the canal have "right of way" which may cause some delay in pedestrians crossing the bridge. The visitor center/exhibit hall, restrooms and parking are accessible. Canoeing: Glide along the amber colored waters of the historic Dismal Swamp Canal in your own canoe or kayak. A boat ramp near the parking area gives access to the canal waters. Don’t forget your life vests! Education and Events: Rangers hold regularly scheduled educational and interpretive programs about the Dismal Swamp. To arrange a special exploration of the Dismal Swamp for your group or class, contact the park office. Click the "Events" link on the menu to the left to learn more about events at Dismal Swamp State Park. Hiking and Mountain Biking: There are 16.7 miles of former logging roads for hiking and mountain biking through the swamp forest. The park protects 22 square miles of forested wetland in the Great Dismal Swamp, the largest remaining swamp in the eastern United States. Historically, the swamp was much wetter than what you see today. Extensive ditching and logging have changed its character over the past 200 years. Today"s Dismal is dominated by red maple in place of the bald cypress and tupelos that once flourished here. But make no mistake; the Dismal Swamp is still an area of great natural significance. Populations of Atlantic White Cedar can be found along the western edge of the park. The cedar trees grow in deep peat soils common to the area. Hessel"s Hairstreak, a rare butterfly species dependent on the white cedar, has been seen here. Black-throated green warblers may be found nesting among these conifers. Only a few old logging roads and ditches break the vast forests of the park. The roadbeds serve as park trails and form habitat used by a wide variety of wildlife that live in the forests. Bobwhite and turkey are often seen feeding on seeds and insects here. Deer and marsh rabbits browse on the green herbs that thrive in the sunlight. Blackberry brambles and devil"s-walking-stick are abundant along the roadsides. The fruits of these plants are favorite foods of the numerous black bears that live in the swamp. Persimmon, poke, blueberry, various oaks, black walnut and tall pawpaw also provide food for wildlife. Tracks of raccoons, opossums, and gray fox can be seen along the roads. Bobcats roam these open areas in search of prey. Butterflies abound in the Dismal. Forty-three species have been identified in the park so far. Huge numbers of Palamedes and zebra swallowtails can be found "puddling" along the roads during certain times of the year. Tiger swallowtails, Atlantic holly azures, and variegated fritillaries are also present in large numbers. Along the forest edge supple-jack, grape, and greenbrier create dense tangles of vines. Neotropical songbirds such as the American redstart and the black-and-white warbler find these conditions perfect for nesting. Yellow-throated warblers and white-eyed vireos are often heard among the vines, but can be difficult to see. Swainson"s warblers are known to nest within the swamp, but they are rarely seen. Prothonotary warblers and wood ducks can be spotted along the ditches that parallel the roadbeds. Seven species of woodpeckers are present in the park. Red-shouldered hawks can often be seen flying through the forest. Occasionally barred owls can be heard calling from deep in the swamp. Visitor Center Open 8 a.m. – 4:30 p.m. daily, hours are subject to change, call park office for exact times.